I reached a very big milestone on Teachers Pay Teachers this month. Check out the blog post on TPT. To celebrate, there will be some very cool FREEBIES, so make sure you are following the TPT Facebook page. Click HERE to go to their Facebook page. This really has been an incredible year and I am so thankful for the generous and loyal customers and followers. I never thought over a year ago when I started this venture, what it could turn out to be. After graduating from Texas Tech and receiving my Masters of Science, I thought, "well, now I've got some free time!" NOT!! 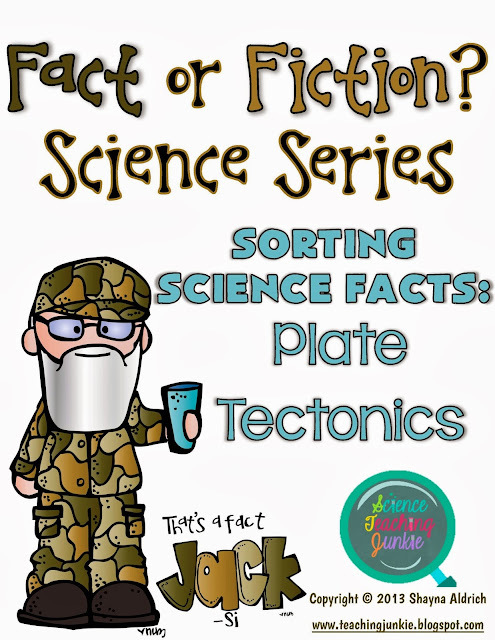 I have filled most of my free time creating new products for the science classroom, blogging, pinning things on Pinterest, brainstorming new ideas of things I need to create, searching for clip art, etc... This has become my 2nd job. My classroom has always been my "creative outlet", but being able to actually have other people purchase and use the things I make just amazes me. It's so nice to feel like other people and students are benefiting from my hard work and actually find it to be valuable. Who woulda thunk it?!?! I can't wait to see what the next year brings and I wish you all a prosperous 2014! Thank you, thank you, thank you...I can't say it enough. A Christmas Gift that Rocks! With Christmas around the corner, I thought I'd share one of my recent crafty creations. On Black Friday, I came across a deal I just couldn't pass up.... A Silhouette Cameo with exclusive designer package for $249 (with tons of other goodies in the package)! I am still learning all that it can do, but I am having so much fun playing with it. 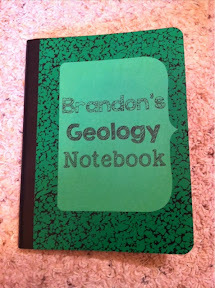 Over the Thanksgiving break, I discovered that my 9-year told nephew wanted to be a geologist when he grew up. I commented that "if he was bad, I was going to give him a lump of coal or a bag of rocks for Christmas." 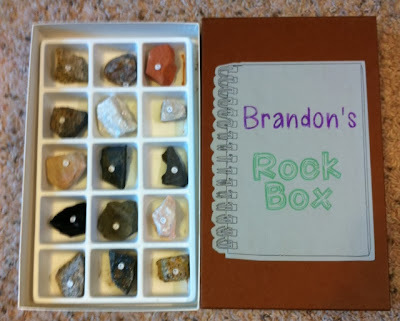 His mother told me that he might actually like that, since he wanted to be a geologist someday. So with the new Cameo and my creative spark, I decided to put a gift together for him that would fuel this fire he had. 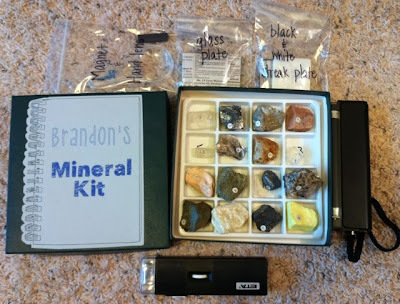 And the Mineral Kit (which is my fave! 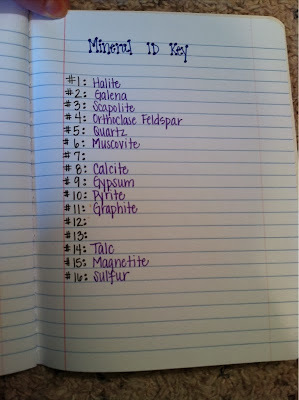 ), contains everything he needs to identify the 16 minerals. I included a black light, hand lens, magnet, glass plate, black and white streak plate, and hand held microscope. 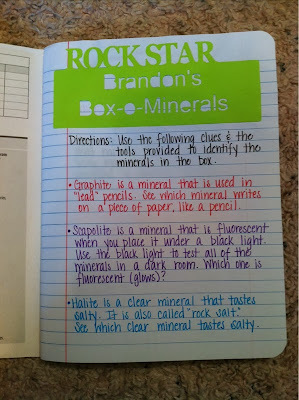 I also created a Geologist's Notebook for him to use to identify the minerals and keep careful notes about his observations (like good scientists do, of course). Here you can see the clues I gave him. I tried my best to simplify the clues for a 9-year old. Merry Christmas! For all of my followers, stay tuned! I have big news coming soon. I reached a big milestone on Teachers Pay Teachers, so be watching out for some fun giveaways at the start of the new year. We are all scrambling to finish buying and wrapping presents, putting the decorations around the house, putting the Elf on the Shelf in a new location each night for our children, passing out gifts to our students, should I continue?? The madness never seems to end! It's easy to forget the real reason for this season, but take a moment to pause and listen to the true sounds and spirit of Christmas. This video will give you chills (or in my case, happy tears). Share something meaningful with those you love - let the message be contagious. Pause, be thankful and celebrate the Lord! He is the reason for the season. When students have to read a statement and determine whether it is fact or fiction, they are thinking deeply and critically. My newest science series forces students to think about what they know about particular concepts and determine whether the given statement fits into that knowledge bank or not. It is often more than just a simple true or false. For example, the statement "Oceanic crust is older than continental crust." requires students to think about the process of how and where crust is formed and then think about how this relates to the age of the crust. After critically thinking about this statement, students should discover that the statement is false because oceanic crust is constantly being destroyed at subduction zones and reforming along divergent boundaries. Continental crust is less dense and rises to form mountains, and is not destroyed by subduction. For these reasons, continental crust is older. In each product I have provided several different versions of the activity. One version allows the students to cut out and sort the cards themselves (and can either glue the sorted cards into their interactive science notebooks or have the teacher check answers.) 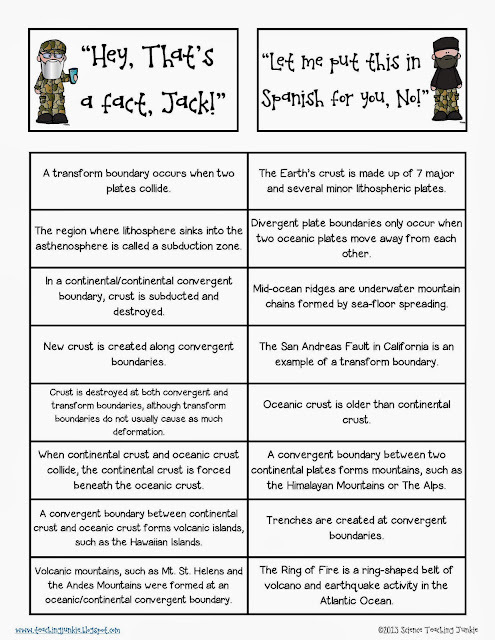 The second version can be printed, cut and laminated by the teacher ahead of time (allowing you to use it year after year). 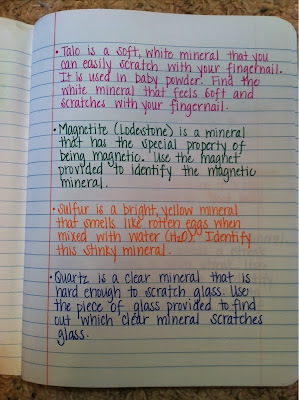 For this version, I have also provided an answer sheet for students to record their answers. If you need a time-saver method, just have the students shade the boxes that are false. To check out the first few products in the series, click HERE (or on any of the above images) to be taken directly to my store. Try this! 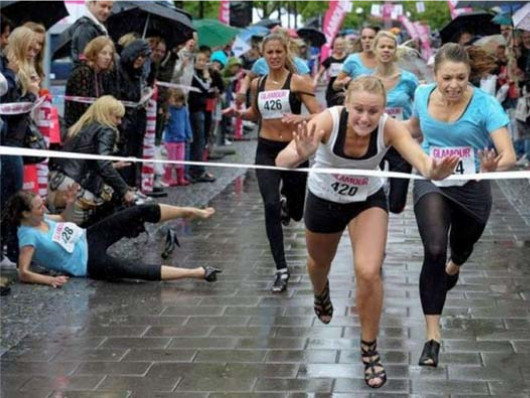 Make at least 5 observations about the picture below. Now, make at least 2 inferences based on those observations. One of the most valuable skills young scientists need to develop is the ability to make careful observations based on what they see. These are based on factual evidence and key details. Often times, the brain automatically jumps to conclusions based on previous life-experiences, so you must teach young scientists to eliminate these biases and focus on the difference between an observation and an inference. Observations must be factual and are collected using the five senses. Inferences are conclusions based on those collected observations. Teach your students that their inferences must be justified and explained using the collected observations. Over the past few weeks, I've been working on a product that will help you build better scientists. 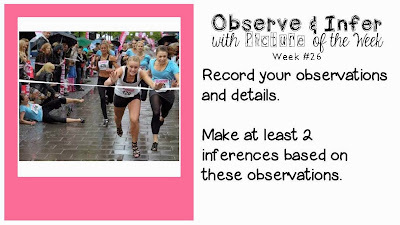 It's called "Observe and Infer with Picture of the Week". It is something that is simple to incorporate into your weekly schedule and if used consistently, you will begin to see better critical thinking, observing, inferring, writing, reading and speaking. 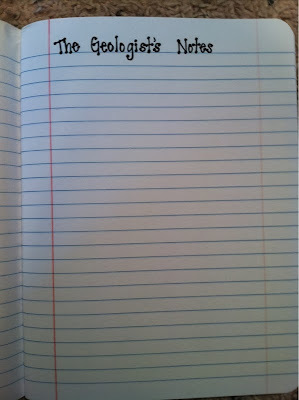 What teachers doesn't want that? Making detailed observations takes time. 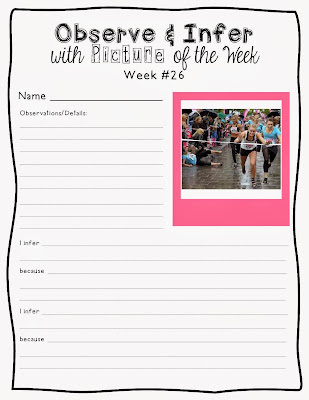 Incorporate this activity into your weekly routine, so students come to expect it. I would recommend that you begin the year, completing the Observe & Infer activity as a class, and gradually move to small groups, partners, or individuals as students become more comfortable and grasp the concept. Even if you choose to have your students work individually, it is still important to continue giving your students the opportunity to share their observations and inferences with at least one other classmate. I have included a student print-out that you may wish to use in the beginning to reinforce the expectations, but as the year progresses, you may wish to eliminate the print-outs and have students record their observations and inferences in their Interactive Science Notebooks. 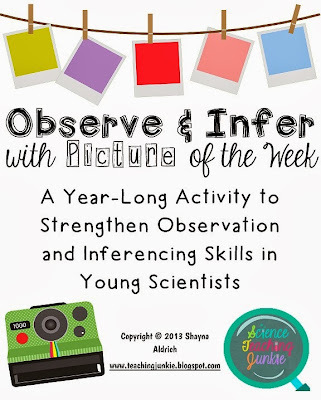 What you get: 38 weeks of Observe and Infer pictures, student print-outs for all 38 weeks, 38 picture of the week slides for display in both PDF and PowerPoint formats. Teachers Pay Teachers is having a HUGE SALE for Cyber Monday and Tuesday. To get 28% OFF all products in my store, head on over and fill up your virtual shopping cart. Make sure you enter the promo code: CYBER to get the additional discount on top of the 20% sale I'm already having. 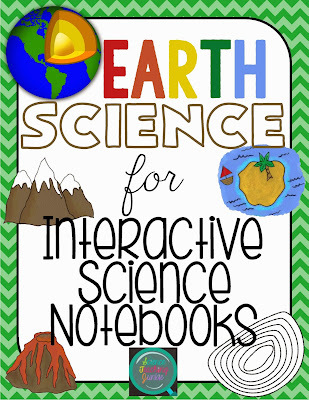 I have a new "Earth Science for Interactive Science Notebooks" product that you will want to add to your collection along with some new "Easy As Pie" activities and Exit Ticket ideas.